ProMMAnow.com will host a LIVE stream of Bellator 79 this evening, kicking it off with the preliminary card at 7 p.m. ET (4 p.m. PT), then moving into the main card at 8 p.m. ET (5 p.m. PT). 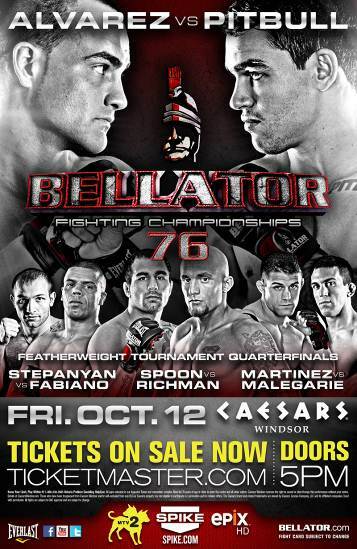 The Bellator 79 weigh-ins were completed earlier today in Orillia, Ontario in preparation for Bellator’s Friday night event at Casino Rama. Bellator 76 features a main event between former lightweight champ Eddie Alvarez and Patricky “Pitbull” Freire. The quarterfinal round of Bellator’s Season 7 featherweight tournament also gets underway this evening. The Bellator 76 weigh-ins were completed today in Windsor, Ontario in preparation for Bellator’s Friday night event at The Colosseum at Caesars Windsor. Eddie Alvarez vs. Patricky Pitbull will headline in a Featherweight Feature Fight. The Bellator promotion has finalized a stacked night of fights that include the highly anticipated lightweight showdown between Eddie Alvarez and Patricky Pitbull, as well as the Season Seven Featherweight Tournament at Bellator 76 on October 12th.